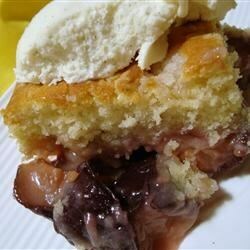 "We used to make this as a great way to sweeten the tart plums from the tree in our yard, but any plums will do. Great when served warm with vanilla ice cream." Place the plums into the bottom of the prepared baking dish. In a large bowl, mash together 2/3 cup butter with 1 1/2 cup of white sugar until the mixture is smooth and creamy. Beat in eggs, one at a time. Stir in 3 cups of flour, the baking powder, and salt. Mix in the milk and vanilla extract to make a smooth batter. Pour the batter over the plums. Mix 1 cup of sugar, 1/2 cup of butter, 1/4 cup of flour, and cinnamon together in a bowl to make a crumbly topping; spread over the batter. Bake in the preheated oven until a toothpick inserted in the center of the cake comes out clean, 45 to 50 minutes. We could taste the baking soda in this recipe. Somebody complained about the taste of baking soda. I can't see anywhere in the recipe where it calls for baking soda. Delicious! Didn't change a thing, and didn't need to! Sweet, tart, crispy and soft all in one pan. Made this withfresh plums that had to be used up. OMG it was delicious! I served it warm with a bit of whipped cream on the side. This is definitely a keeper!